Kadhi is a regular feature for lunch or dinner in most Gujarati homes. Kadhi is usually made to accompany a rice dish, be it plain rice, pilau or even biryani. Yes, some Gujaratis need kadhi with biryani. The type of kadhi will vary from area to area. But as the saying goes, no one can make kadhi and tuvar dal like the Patels. When I say Patels it includes the Amins and Desais or to be more specific Gujaratis from Charotar area of Gujarat. My mum always use to tell me that if I didn’t know how to make kadhi then I’m not a true Patel. At that time it did sound scary that perhaps I’d be excommunicated from the community if I didn’t know how to make kadhi! Well, that’s me when I was a kid. There is nothing more satisfying than a bowlful of hot kadhi with a generous helping of ghee. I remember that was my grandmother’s ‘nuska’ (remedy) for colds and coughs. And why not, isn’t that an Indian version of soup. Kadhi, plain rice and dry preparation of cowpeas or green moong or even split yellow moong is my all time favorite. Kadhi is something that my daughter Nami has not learnt how to make. Simply because she claims that she doesn’t like kadhi. So, my grouse with her was that every Gujju should know how to make kadhi (passing on m mum’s threat ;)) After much pestering one fine day she said ‘Okay I will make the kadhi, you just give me the measurement’. I was left speechless. Who learns to make kadhi using measurements. I realized that I learnt by watching my mum, she learnt watching her mum.Nowadays most girls do not get that much time to spend in the kitchen with their mums, aunts or grandmothers as they concentrate on studies and other activities. My dad always insisted that equal amount of time should be spent learning housework,cooking etc. This recipe is also dedicated to Rakshabhabhi. I learnt how to make kadhi from my mum but to make nice creamy kadhi I learnt from her.The simple secret that she told me was to use more yogurt than the water. The other person I must dedicate this recipe to is Shruti my cousin. Simply because when she was younger, she would often come down to Mombasa from Nairobi on her own for a holiday. During one of her holidays, Nunu, my mother in law made her sit near the cooker with a long wooden spoon and asked her to stir the kadhi. We were having guests over for dinner. So Shruti is busy stirring the kadhi and Nunu and I are wondering why the mixture is not getting thick. After a while, we realised that we had not switched on the gas! Poor Shruti. So Nami I have finally put measurements to the recipe for kadhi. Mix yogurt, water and chana flour in a pan. Whisk the mixture using a hand blender or whisk. Make sure no flour lumps are left. Add curry leaves, methi, cumin seeds, salt, gur,turmeric powder ginger and chilli paste.Mix well. Put the pan over medium heat and stirring constantly for 7 to 10 minutes, heat the mixture. Please keep on stirring the mixture otherwise it will curdle. After 10 minutes the mixture should appear a bit thick and creamy. Lower the heat and let it simmer for further 10 to 15 minutes. Stir occasionally so it does not boil over. For tempering, heat the ghee in a small pan over low heat. When it is hot, add the cloves, cinnamon, peppercorns and methi. When they begin to sizzle, add the mustard and cumin seeds. Add the hing, curry leaves and garlic if you are using some. The curry leaves will become crispy. Pour the tempered mixture immediately over the kadhi. Can use less gur as it entirely depends on how sour the yogurt is. Curry leaves washed and patted dry, freeze well in a bag or container. Can prepare kadhi ahead and keep. Just heat it up before serving. If it has become too thick, add a bit of water. My mum sometimes use to add fresh peas or pigeon peas(tuvar) that have turned yellow. Boil in salted water before adding to the kadhi. When we made aam ras at home, my mum would put a couple of the seeds or gotlas into the simmering kadhi. The kadhi tasted so much better. This Kadhi is so creamy and delicious!! It even got a stamp of approval from my toddler – ' Mama tasty!' Thank you Aunty! Thanks Amrita, and yes there is a difference between the two. I love kadhai.. be it our North Indian version or the Gujarati/Rajasthani version.. your kadhi looks absolutely divine!! Want to pick the spoon and slurrppp slurrrppp!! Thank you so much Swaty. Kadhi sounds mouthwatering Mayuri. Adding of mango seeds in kadhi is new to me. I can imagine the taste. Lovely share. Trust me it tastes really good as while the kadhi is simmering the remaining pulp from the ripe mango infuses into the kadhi. Kadhi is one thing which I have beautiful memories of. With so many Gujju friends I learnt tricks and trades of making it. I can eat this any time of the day. Thanks Lata, kadhi is a regular on our table. Kadhi looks absolutely delicious and just prefect to have with some rice without any fuss. Fantastic dish, hard to resist.. Thanks Freda and yes on its own too kadhi is really good. Whenever I get kadhi in my thali, I am a happy girl. I see you have used mari in vaghar which I never use, I’ll use next time and see how my family like it. Thanks Jagruti and try it…the flavor is good. These heirloom recipes are so valuable. Thanks for sharing with us. The kadi is so delightful. It is totally a comfort food. That feeling of savoring a bowl of kadhi made from a family recipe is absolutely priceless. Thank you so much Piyali…it certainly is comfort food. I love the colour of kadhi.kadhi sounds very interesting and looks delicious . Kadhi is one comfort food for me, there’s a little difference in the preparation in each community. Looks tasty. Such a soulful recipe. I love recipes which time and time again never failed to be loved, so glad to see this heirloom khadi recipe, mayuri di. 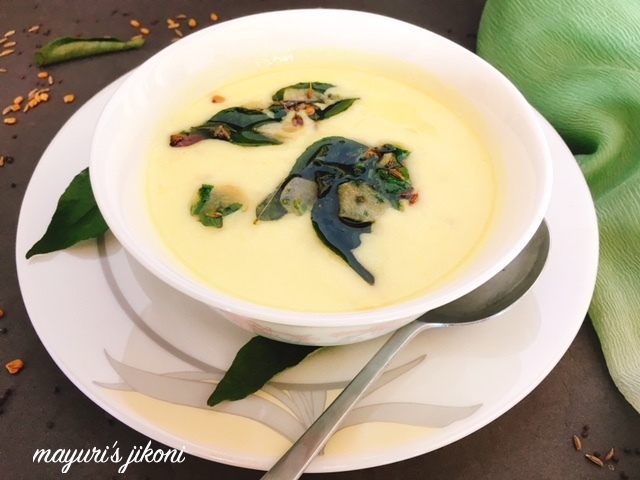 Kadhi is one of the easiest comfort food!! I love the addition of curry leaves in the end. Gives a nice pop of color. Thanks for sharing such a tasty classic recipe!! Thanks Preethi, adding the curry leaves tempering at the end not only adds colour but also flavor.